Video clips from the barn owl nest box under the roof of Bein Wine Cellar: Since 2011, many generations of barn owls have grown up under the roof of our winery. Have a look at the nest cam examples from 2011 below. August 29, 2011: the fourth chick is hatched! The first egg is hatched! Click here for our latest stories of the current vintage! June 2018: Water is increasingly scarce in the Cape. So we decided to set up a rainwater harvesting system. We are confident that we can cover the entire demand in house and cellar, since we have relatively large roof areas, and even that little bit of rain of a dry year should be enough for us. The water is collected in large tanks and treated through a special filter system to drinking water quality, before it is fed into the home network - and the great thing about it: our water tastes better than city water, and is even without chlorine or other additives, ideal for a wine cellar! The currently reigning El Nino brings about stressful drought periods in the Cape. Fortunately, we have good scientific tools to assess the water needs of our vineyard. We already long relied on soil moisture probes as well as on the evaluation of current weather data. 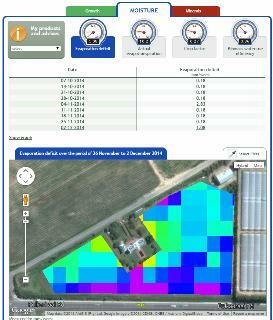 What is new is satellite-based multispectral analysis of the water status of our vines. This allows us a good estimate of our vine's effective water use. Moreover, it gives us additional information regarding growth and even nitrogen status of our plants. This service is available thanks to an initiative of the Western Cape Department of Agricultural, which aims at promoting water saving in agriculture. For more information, have a look at www.fruitlook.co.za . Musical surprise: "Tiny little winery"
The Rock Kestrels love it, too! After a pair of rock kestrels showed interest in our owl box at the winery, we swiftly installed a second one just beside - and they gladly accepted it! So it happened that we have now owls and kestrels happily living together under one single roof, regularly raising 3-4 chicks each every year. Of course, there is a video clip of the kestrels, too. 20.Nov.2010: Our Merlots were well received by the judges for PLATTER'S 2011 edition, South Africa's most influential wine guide: 4 1/2 stars each for the Bein Merlot 2008 and 2009 as well as for the Merlot Reserve 2008, 4 Stars for the Little Merlot 2009, and 3 Stars for our Pink Merlot 2010, particularly recommended as best value rosé! 14.Nov. 2010: Silver medal for Bein Merlot 2008 at the prestigious MONDIAL DU MERLOT 2010 in Lugano (Switzerland), an international wine competiton exclusively for Merlots from all over the world. 16.Oct.2010: EMOZIONI DAL MONDO:MERLOT E CABERNET INSIEME, an international wine competiton in Brescia (Italy) specialised on Merlot/Cabernet wines, has rewarded our Little Merlot 2009 with a gold medal and the Press Prize for the best South African wine of the show. There are currently barn owls and rock kestrels competing for our nest box at the winery as breeding place, so we simply put up a second box - now with a camcorder! Check out the sample with the owls. We could watch it for hours! London/Sunday Times: Who said wine tours were only for buffs? 11.4.2010: In the context of the Soccer World Cup, a series of South African reports have been screened on European TV, amongst others this little review about Bein Wine (in German).